It is outrageously hot out. Hot and dry enough that our area has issued a no grilling ban. That’s right, we aren’t allowed to grill in our own backyards due to the increased risk of fire at the moment. That sort of kills our traditional s’mores night after some good grilled burgers. And to be frank, it’s too hot for that anyway. I bet our marshmallows and chocolate would just melt on their own. Of course, I suppose you’re thinking I could always just make them inside with the broiler. It’s a valid option. If I wasn’t avoiding heating up my kitchen and causing my air conditioner to go out. That’s where this fantastic recipe for frozen s’mores comes in. Creamy, melty, decadent, absolutely perfect for a summer treat! Graham cracker crumbs for topping, or you could use mini chocolate chips. If you are starting with whole graham crackers throw them into a food processor until they are good and crumbly. Drizzle in the butter and mix until well combined. Don’t try to eat this, as you will not stop. Grab your cupcake pan and put in cupcake liners, then give each a spray of nonstick spray. Divide the crumbs into each cup as evenly as possible. I used one of my kid’s cups to really squish them down to solidify into the crust. The people who make graham crackers should really just start making them in disk shapes for for me. Mix your chocolate and cream into a bowl and begin microwaving for ten to twenty seconds. Stir, and repeat until you have an oozy yummy, hot chocolate mixture. Spread the chocolate onto of the graham cracker crusts. I used a spoon, but the original recipe suggested using a pipping bag, or Ziplock with the tip cut off. Do what makes you happy. 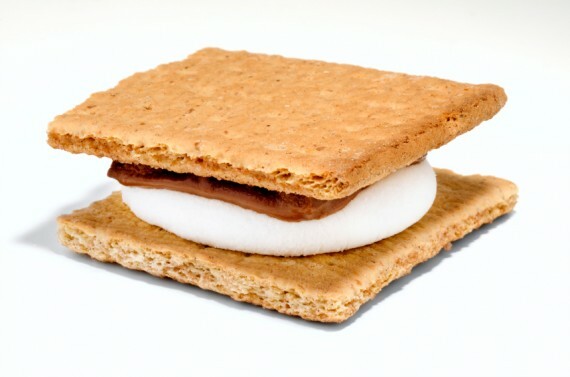 Spread out your marshmallows on top of the chocolate and graham crackers. Yum. Set all of that aside to firm up a little. Mix your milk and pudding mix on medium speed for 2 minutes and then fold in 1/2 of your Cool Whip. Try really hard not to eat all of this. Spoon your pudding mixture on top of the marshmallows. Once you got it all in, pick up and gently tap the cupcake pan on your counter. That will help your pudding get into all the nooks and crannies between the marshmallows. This will also help to level everything off. Freeze for at least four hours, but over night seemed to be perfect. When frozen allow it to sit at room temp for about five minutes to loosen from the cupcake pan. Pull them out and pipe the rest (or spoon if you are lazy like me) on top. Then sprinkle with your graham cracker crumbs for an extra dose of pretty.